What if you bought three bananas and threw one away every day? Approximately one-third of global food is wasted every year. If all of us reduced our food waste, we can help the global fight to feed a hungry and growing population. We can also preserve our natural resources and protect our environment. Though the FAO estimates that 33% of our food goes to waste, other organizations like the U.S. Natural Resources Defense Council (NRDC) puts the total at closer to 40%. That incorporates food lost or wasted in the field, in handling and processing, in retailing, in the home, and in all steps along that long chain. Whichever stat you choose, the information is still hard to ignore – we must curb our own food waste if we want to be more sustainable and mindful of a growing population. 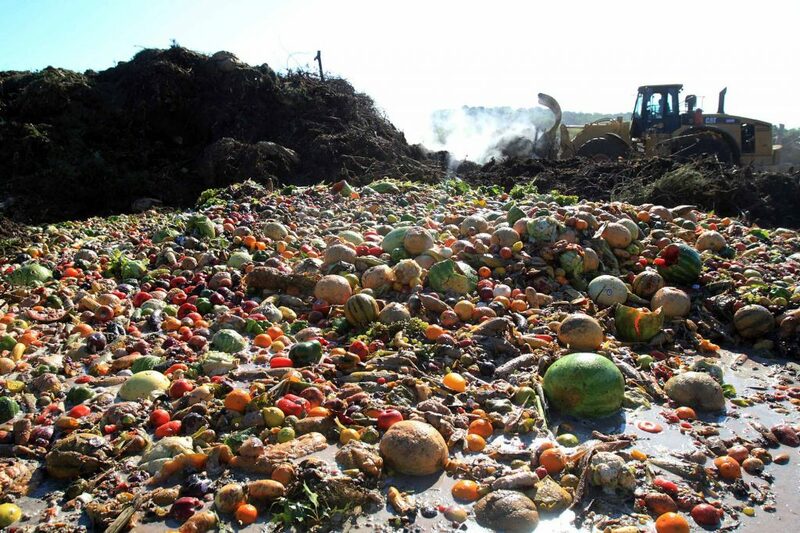 Food loss and waste is a worldwide problem. 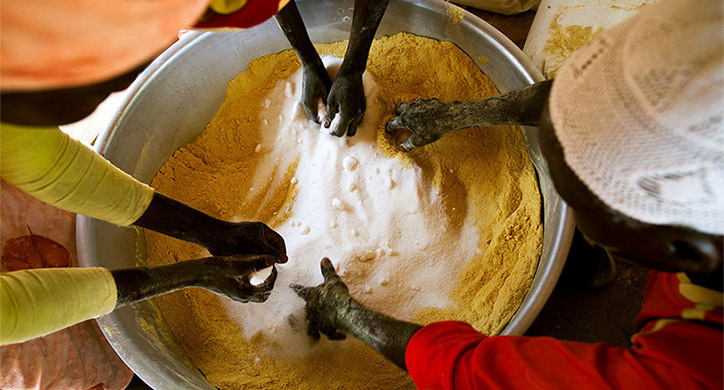 According to the FAO, the amount lost is roughly $680 billion annually in industrialized countries and $310 billion annually in the developing world. While exact figures and statistics on food loss and waste can be debated, we can agree on the enormity of the problem. 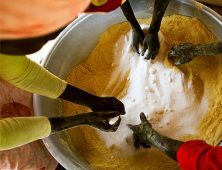 With an annual estimated price tag of food waste and food loss approaching $1 trillion and a world in which the UN estimates one in seven people goes hungry, the issue has emerged as a high-priority action item. It has now become the intense focus of a coalition of global initiatives, led by diverse government and international agencies, dedicated charitable and religious organizations, the commercial food sector, and concerned individuals across the public and private sectors. Where do food waste and loss occur? On the farm and in the field. 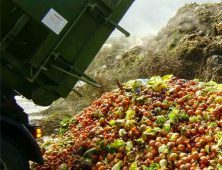 Food production poses a variety of challenges and the FAO estimates that about one-quarter of global food waste and food loss (24%) occurs here. At this stage of the food chain, the problem is largest among fruits and vegetables. Commodities may spill from equipment onto the ground or simply rot in the field. These losses are greatly affected by weather problems and labor or equipment shortages. Some products may simply not be harvested, due to cosmetic or quality issues, or even simple market considerations. 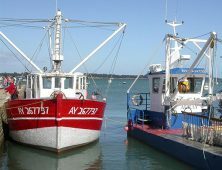 Seafood is also a source of waste. 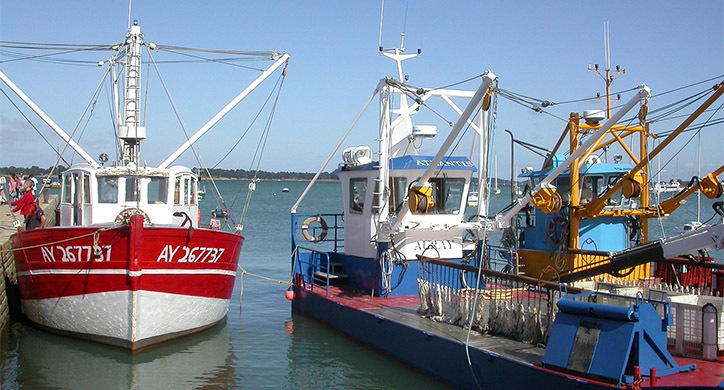 You may recall in “What’s the Catch,” the D2D team reviewed the issue of bycatch waste in aquaculture. Similarly, practical matters involving equipment, labor, and technology often contribute to the problem. Lack of effective refrigeration and shortages of available storage are examples. If not managed with food safety in mind, pests and diseases can also attack food supplies. 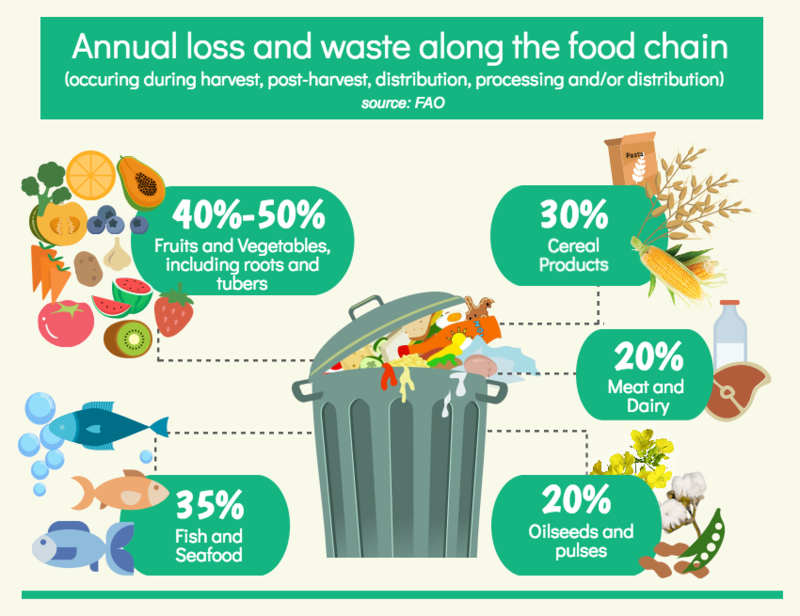 FAO estimates total food waste and food loss at this stage of the chain at about the same level as production— approximately 24%. Technical problems often contribute to food waste and food losses at this stage of the chain. As with post-harvest storage, lack of refrigeration, mechanical and other environmental malfunctions, and a host of other complications may contribute to the problem. Food manufacturers acknowledge that a good deal of the waste associated with their work comes from a byproduct that is technically edible yet hugely unpopular – fat and skins (primarily pork and chicken) in animal processing, for example, or peels, crusts, and husks in fruits and vegetables. However, according to the Grocery Manufacturers Association, as much as three-fourths of the more than 44 billion pounds of such waste created annually are reintroduced into the food stream— not for human consumption, but as animal feeds and feed ingredients. FAO estimates that the largest portion of food waste and loss occurs at this stage— roughly 35%. At the retail level, this waste can be contributed to the overstocking of product or rejection by customers on the basis of appearance. Perishable items, such as bakery goods, fruits, and vegetables, fish, meat and dairy, are notable examples of the problem retailers – and often restaurants – face on a continuous basis. At the consumer level, buyers also often fail to plan consumption needs, properly store or protect food products, or simply forget that the food is in their refrigerator. Confusion over packaging terminology (“use by” or “best by” or “sell by”, for example) also is cited as an issue. Which countries have the biggest problem with food waste and loss? The problem is acknowledged as a global issue, rather than the sole problem of any country, region or group. Analysis of FAO data suggests that about 56 percent of total food waste and food loss occurs in the developed world – meaning North America, Oceania, Europe and the industrialized Asian nations (China, Japan, South Korea). The other 44 percent occurs in what is commonly called the ‘developing’ world. On a per capita basis, food waste and food loss seem to be more pronounced in the developed. In the developed (or industrialized) world, an estimated 40 percent of food waste and food loss occurs at the retail and consumer segments of the food chain. Here, the problems seem to center more on behaviors – the decisions made and actions taken by individuals acting within the food chain, and especially at the consumer level. For instance, have you heard of the expression, “never go to the grocery store on an empty stomach?” Well, when it comes to food waste, there’s the truth here when you don’t consume what once looked so good on the shelf. 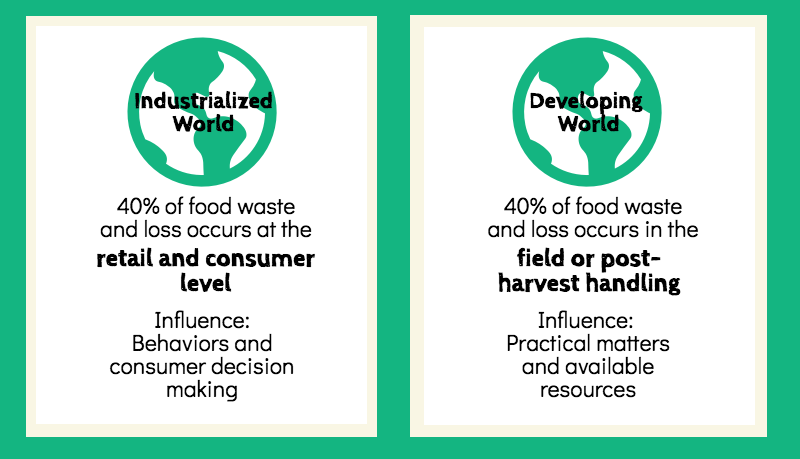 In the developing world, 40% of the food waste and food loss occurs at the early stages of the food chain – in the field and in post-harvest handling, especially. Here, the problem is tied most closely to practical matters– the availability of equipment and related resources, often linked to necessary investment and adequate financing, as well as shortages in the best technology and lack of established technical or managerial expertise. For example, if a tractor breaks down at the end of the growing season, the parts might not be available in time to harvest the crop! Additionally, there might not be enough labor available to pick the crop at peak ripeness. What other problems do food waste and food loss create? Many environmental groups point to the enormous resource implications hidden within food waste and food loss. 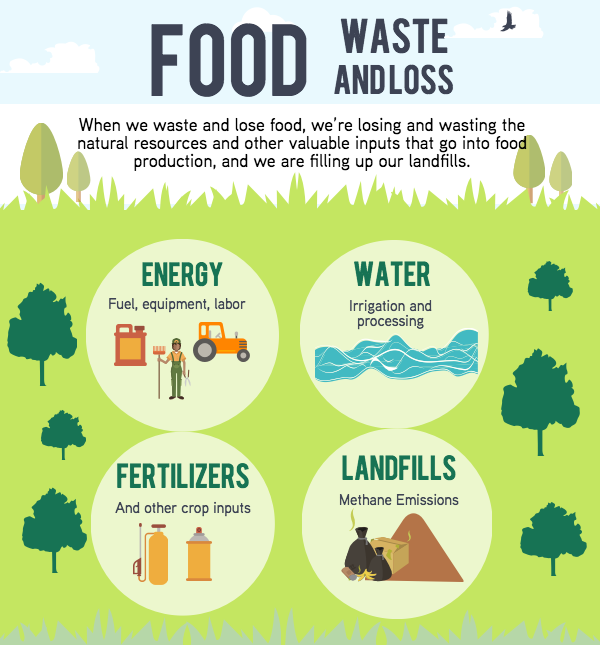 The amount of energy, water, fertilizers, and other crop inputs lost through wasted or lost food is a serious concern— not to mention the financial costs that must be absorbed. NRDC often cites a Scientific American report that estimates that as much as 10% of the total U.S. energy budget is related to farming. Beyond the obvious links to food security and hunger, food loss and waste also raise significant issues about the potential waste of valuable natural resources. Lost and wasted food also wastes water, energy, money, and time – and creates a myriad of associated problems in how unused food is handled or otherwise dealt with. Practical-minded local officials join environmentalists in another often overlooked issue: how they dispose of wasted or unwanted food. The USDA and the Environmental Protection Agency (EPA) recently noted that food waste is the largest single component going into municipal landfills – by some government estimates, more than 20 percent. 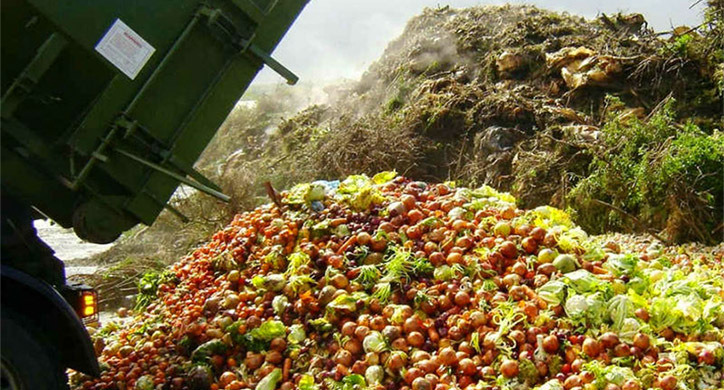 Environmental groups point to what they contend is a significant contribution to total methane emissions resulting from food waste in landfills. FAO estimates the carbon footprint of food produced and not eaten at 3.3 billion tons of greenhouse gases, making food wastage the third top GHG emitter after the U.S. and China. The same study concluded that food loss and food waste may account for as much as 30 percent of the world’s land in agricultural production. The significance of the link between food waste and the environment is becoming increasingly clear. The Ogallala aquifer, for just one example, provides critical irrigation for as much as $20 billion in U.S. food and fiber production annually. With aquifer levels showing a steady decline across major U.S. crop production areas, efforts to avoid food waste and food loss have taken on an increasingly prominent and important place in efforts to sustain our natural resource base. Food waste and food loss are inextricably linked to water waste. Wasted food is also wasted water. 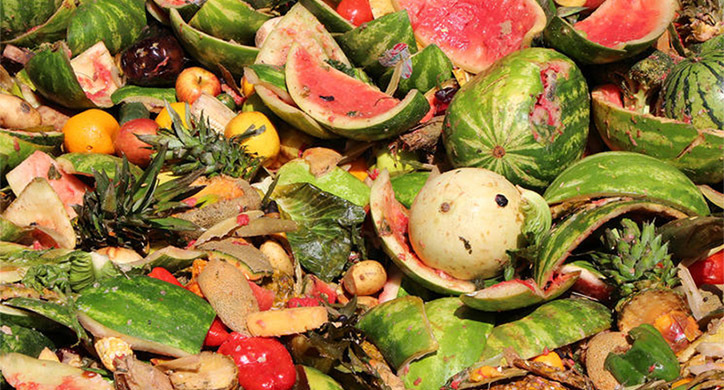 What is happening to deal with the problem of food waste and food loss? Response to the challenge of food waste and food loss has been gaining momentum through the efforts of a diverse set of members of the public and private sectors. Much of the drive to address the issue comes from grassroots efforts. Churches, charitable groups, food banks, and concerned individuals have been at the forefront of various efforts to reduce waste and loss, often through better coordination and communication among those who have food and those who need it. Collection of food that would otherwise go to waste from wholesalers, supermarkets, and restaurants is a high priority for these groups. The roster of organizations devoted to dealing with some aspect of food waste and food loss now numbers well over 50 worldwide. USDA and EPA recently joined forces to create the U.S. Food Waste Challenge – a united effort to reduce, recover, and recycle food loss and waste. Among its various activities, the initiative provides a platform for collecting and sharing information, especially on best practices in waste and loss reduction. In its initial year of existence, the Challenge surpassed expectations in attracting almost 4,000 participants from across the entire food chain and appears well on its way to meeting an ambitious target of reducing food waste and food loss by half by 2030. What are some of the proposed solutions to food waste and loss? Efforts to reduce food waste and food loss address a wide range of issues. Some relate to the nature of the food system and its activities. Others focus on behavioral changes based on greater recognition of and attention to the causes of food waste and food loss. The Food Waste Challenge, for example, points to three major areas for attention. Reduction of food waste and food loss, through such things as improved food product development, enhanced storage mechanisms, cooking and preservation techniques, smarter shopping and ordering, and better labeling. Recovery of food waste and food loss, by connecting organizations committed to alleviating hunger (such as food banks and pantries) with food products that otherwise would go unconsumed. Food waste tends to grow as populations economically advance. To help preserve the environment as well as feed a growing population, we can all be mindful consumers by planning our meals ahead of time, paying attention to how much food we buy, properly storing our food in the refrigerator, starting a compost pile to reuse thrown away food, and donate unused food to a food bank.